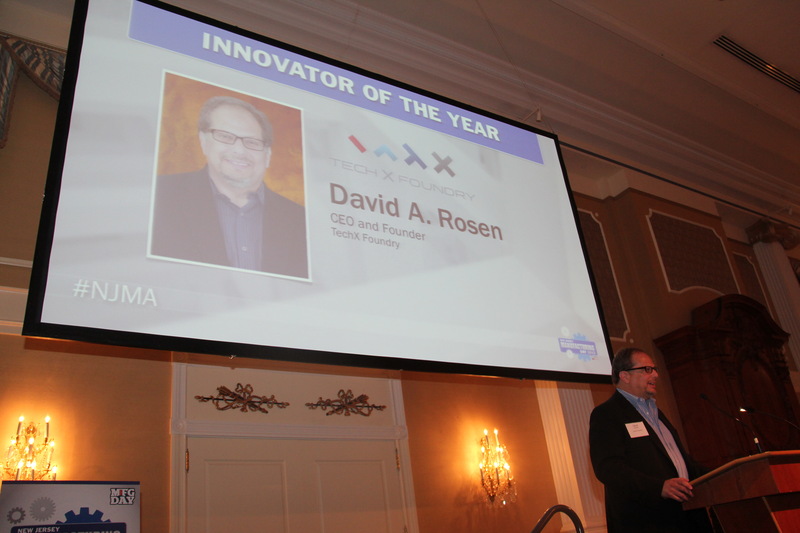 Our Founder & CEO, David A. Rosen Receives Innovator of the Year Award for Manufacturing Day 2015 | TechX Foundry - A Center to Commercialize Tech Hardware Products from Concept to Market.. Thank you very much John. 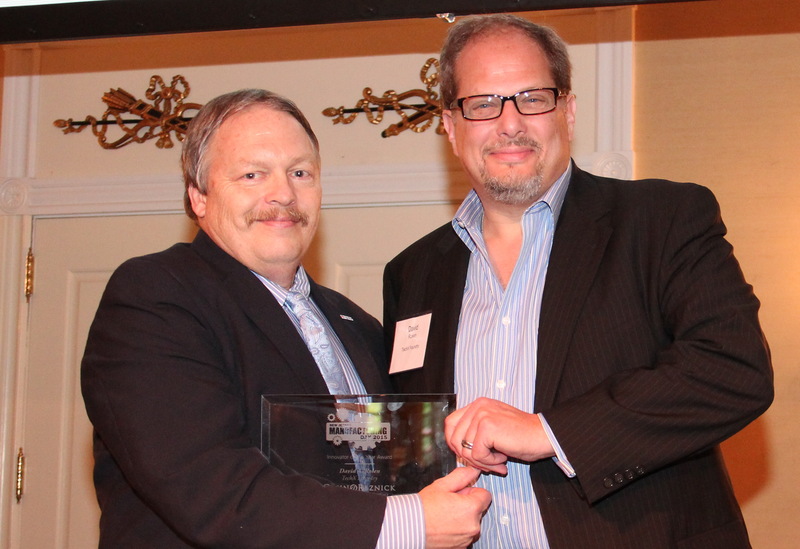 I am honored to be recognized by NJBIZ and NJMEP as Innovator of the year, especially as I am surrounded by so many forward thinking and innovative individuals and companies. 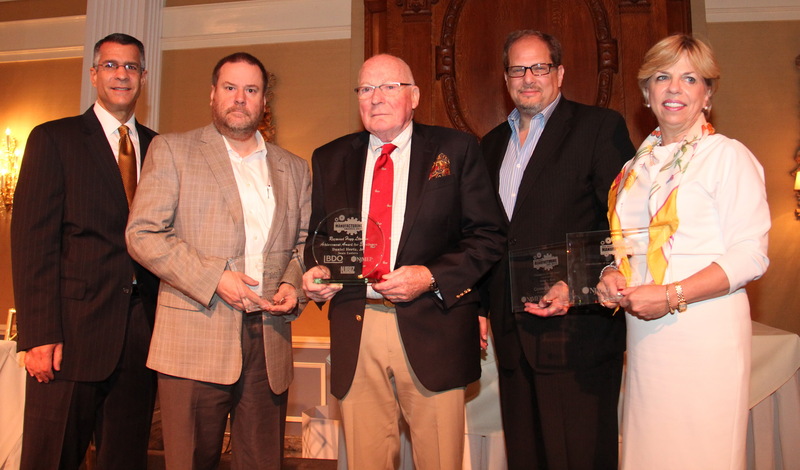 I want to thank my TechX Foundry team, Steve Owens, Denise Spell, and Matt Hagan and the dozen others who are integral to our success. I also want to extend our thanks to all our supporters including NJIT, Scott Goldthwaite, John van Saders, Joel Cartun and many other Tech/MFG Executives from throughout New Jersey and the NY Metro area. I grew up in an era where Information Technology opportunities were going to offset other industries and provide great global growth opportunities for white collar workers in the US. While this was happening, and IT was growing, manufacturing in the US was taking a huge hit and decline. As one example, the number of manufacturers in New Jersey went from a high of around 115,000 in 1986 and is now less than 14,000 companies today. And, where are we in IT? Well, we have outsourced more than 50% of the IT, white collar jobs outside the US and now live in a world where there are more “Honors” students in China or India than there are total college students in the US. 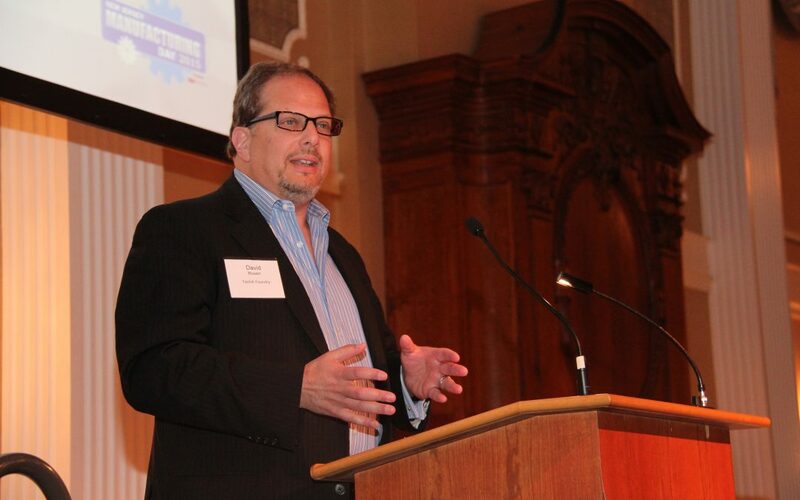 In fact, I sat down with the CEO of a top 5 IT Integrator 2 years ago who told me he hired more than 35,000 scientists and engineers in the past year to support his large base of Fortune 1000 accounts. However, he hesitated and told me he didn’t recruit from any US campuses. His rationale was that none of our schools or campuses could provide enough recruits to make it worthwhile. In my opinion, we didnt have a workforce that would accept the low wages that other countries students would grab in order to work with our largest global enterprises. So, as I stepped back after selling my last software company more than 3 years ago, I realized that we are going through the next Manufacturing Revolution, Version 4.0. We stand here at another cross-roads of opportunity to re-ignite manufacturing here in the US, to address what is still one of the largest consuming countries in the world, and manufacture locally… closer to Demand, rather than off-shore where the benefit is closer to Supply, (lower cost labor or access to materials). A Boston Consulting Group study from less than two (2) years ago, stated that in 2013 there was only a 5% delta between manufacturing in the US versus China for products going to US consumers. Our team at TechX Foundry, and our great partners here in New Jersey and the New York Metro Area, are poised for this new revolution in Tech Hardware Manufacturing. Imagine having access to all the equipment for woodworking, metalworking, electronics, PC Board making, Robotics, 3D Printing, and more for less than what you may spend for your dry cleaning per year. We hope you get involved, take a class, attend your local MakerSpace or Library and help to get on-board a growth industry that will bring jobs back to the US and do that one special thing that the rest of the world doesn’t understand how we do it… we INNOVATE. We hope to see you all soon and that you will attend the opening of our inaugural TechX Foundry Makerspace coming in the first quarter of 2016. Thank you and enjoy the rest of your day.